NOW AVAILABLE: Lemon & Yuzu plants + Unique Kaffir Flavoured Olive Oil! 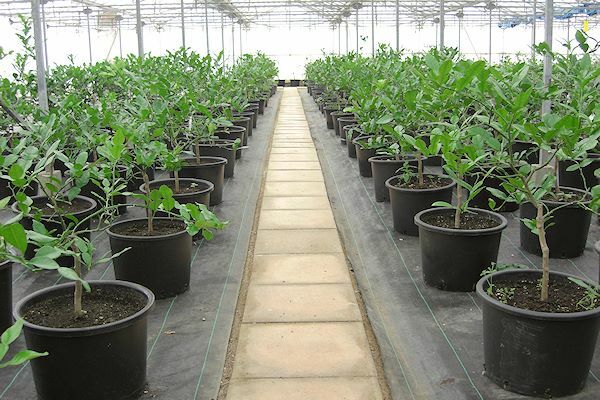 We currently have over 400 kaffir lime plants housed in a temperature controlled greenhouse facility in Ardleigh, near Colchester in Essex. The plants are tended to daily and have a watering system which incorporates an in-line fertiliser feeding system to ensure only the highest quality leaves and fruit are produced. We have recently formed an alliance with another professional grower of kaffir lime leaves in Portugal which has enabled us to offer product for the full 12 months of the year. We have supplied supermarkets and wholesale fruit and vegetable merchants in London’s Covent Garden and Spitalfields markets and merchants in other areas of the UK with fresh lime leaves on a weekly basis for the last 10 years now and have seen their demand increase year upon year. Leaves are picked, cleaned and despatched to their destination within 2 days thus ensuring produce arrives in peak condition. We offer kaffir lime leaves, kaffir fruit, kaffir olive oil and live plants! As the importation of fresh leaves from outside the EU is forbidden under DEFRA rules due to risk of disease, the availability of totally fresh leaves is somewhat restricted. We are one of the very few commercial growers of kaffir lime leaves in the UK. We are confident our products are the freshest available. Deliveries to any EU member countries can be undertaken - please contact us for further details. Known botanically as Citrus hystrix, the kaffir lime is of the Rutaceae subgenus, which contains the citrus family. Fruit from this species are known for their intensely aromatic leaves and rind and inedible fruit. Citronellol and limonene are the primary volatile oils responsible for the plant’s aroma and many beneficial properties. The kaffir lime tree is native to southeast Asia. They grow to a height of 3 to 6 metres given the right conditions but thrive in pots as well. Kaffir lime leaves are evergreen, double lobed and can flower at any time of the year when properly cared for. The flowers are small, white and self-fertilising and they tend to grow in clusters. The kaffir lime fruit is about the size of common limes or slightly smaller and it tastes extremely bitter and aromatic. They are not recommended for fresh eating but the fresh leaves, rind and juice are put to use culinarily to season curries, stir-fries and soups, medicinally to treat coughs or digestive issues, and cosmetically for hair and skin health. Cut the leaves into thin strips add to stir fries, put inside spring rolls, season salad dressings or add citrus zing to fried rice. Bruise leaves and cook in curries, sauces, soups and stews. Bruised kaffir lime leaves can also be used in mixology for imparting exotic, citrusy flavour to alcoholic cocktails. Grate kaffir lime zest into fish cakes or sweets such as Thai style coconut rice, sorbets, or puddings. Crush rinds into pastes to add authentic flavour to curries. Add fresh kaffir lime juice to smoothies, deserts, and soups. Try our brand new Kaffir flavoured Olive Oil to add a kick to your cooking! Blend whole, clean kaffir limes with spring water and use resulting paste on patches of problem skin. You can also use this paste as a cleansing shampoo and hair tonic which is said to slow balding and promote hair growth. Chew on bruised leaves or rub directly onto gums to promote gum and overall oral health. Make a kaffir lime tea with leaves, kaffir limes, and honey to taste to aid digestion and detoxify the body. Use diluted essential oil from the fruit to repel biting insects, massage into the scalp to reduce headache and migraine pain, and add to homemade toothpastes for an anti-inflammatory and antioxidant effect. Massage fresh kaffir lime juice into the skin to moisturise, neutralise free-radicals and reduce the appearance of scars. Use distilled kaffir lime essential oils to scent baths, mix into home made deodorants and body sprays, and add to lotions and creams. Mix kaffir lime juice with vinegar and water and mix well in a spray bottle to use as a general surface cleaner around the home. Add essential oil into non-scented laundry detergent for wonderfully clean smelling clothes. Browse our packs of kaffir lime leaves, peruse our stock of kaffir lime fruit or ponder our selection of kaffir plants. Whatever you choose to purchase we're confident that it will be some of the freshest exotic kaffir leaves and limes that you've tasted. HERE ARE DETAILS OF THREE SPECIAL PROMOTIONS CURRENTLY RUNNING. BUNDLE ONE: ORDER ANY MATURE PLANT (KAFFIR, YUZU OR LEMON) + 250ML BOTTLE OF KAFFIR OLIVE OIL FOR £52.00 WITH FREE DELIVERY. BUNDLE TWO: ORDER ANY MIX OF TWO PLANTS (OR TWO THE SAME) + 250ML BOTTLE OF KAFFIR OLIVE OIL FOR £85.00 WITH FREE DELIVERY. BUNDLE THREE: ORDER ANY MIX OF THREE PLANTS (OR THREE THE SAME) + 250ML BOTTLE OF KAFFIR OLIVE OIL FOR £110.00 WITH FREE DELIVERY. TO TAKE ADVANTAGE OF THESE OFFERS, JUST PLACE YOUR ORDER FOR THE CONSTITUENT PARTS VIA THE ORDER PROCESS PAGE IN THE USUAL WAY AND WHATEVER THE ORDER CALCULATES TO, WE WILL CREDIT BACK THE DIFFERENCE TO YOUR CARD TO EITHER £52.00, £85.00 OR £110.00 ACCORDINGLY ONCE YOUR ORDER HAS BEEN RECEIVED.